Chris Mercier is an incredible artist and master printmaker, whose practice combines digital and analogue print to produce stunning and accomplished work. Ahead of his participation in the group exhibition Frankenstein, which is being held at the Espacio Gallery in Shoreditch from 5th June 2018, we caught up with him to see how he produces his work, what interests him in the printing process and how technology has affected his practice. Victor Rows Out, Conte pencil drawing for Frankenstein’s Toile. 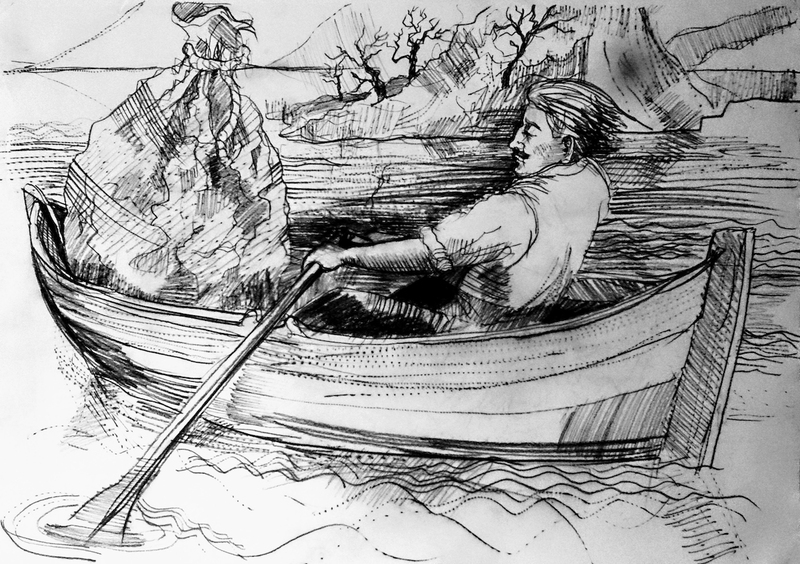 It depicts Victor rowing out into a Scottish loch to sink the dismembered remains of his aborted attempt to make a partner for his creature. Tegen: What first attracted you to print? Were you ever tempted by another medium? Chris: I have always had a fascination with printing, even as a child. I remember my school had a “letterpress after-school club” which got me hooked on the real stuff when potato printing lost its lustre. However, I do use other media like drawing, painting, 3D assemblages and video too. Creature And Old Man, Conte pencil drawing on paper. A working drawing for Frankenstein’s Toile, by Chris Mercier. Tegen: How does acting as a master printmaker affect your own creative work? Do you have a favourite artist you’ve worked with? Why did you find it rewarding? Does running a Printmaking Art Editioning Studio change how you see both print and art in general? Chris: Printing art editions for other artists was a way for me to combine making art and earning a living at the same time. I knew I couldn’t survive on just the sales of my own work. I would say that printing and its inherent processes inform my art practice. This became increasingly apparent to me whilst studying for my masters at the Royal College of Art. I don’t think I should choose a favourite artist amongst those I have worked with. However, there have been two artists I worked for who caused me to think more about the concept of “art” itself and challenge my own perceptions of art. They were Joseph Kosuth and the late Richard Hamilton. Tegen: Your work for your upcoming group show Frankenstein, at Espacio Gallery, looks at how analogue and digital practices can be combined to create a new process. Last year you exhibited New Found Consonants Triptych at the gallery which played with the idea of a new language, how do you see this new practice and language emerging and what do you think it’s effect on print will be? 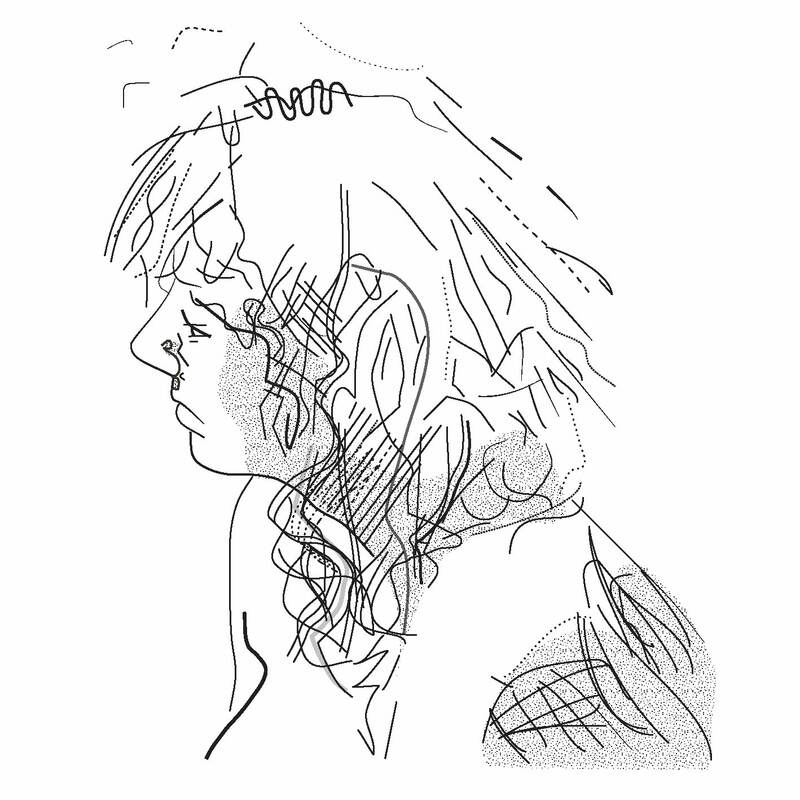 Chris: I think, when I transpose an idea from a pencil drawing to a digital drawing, it is more about “translation”. I see that essentially, it is not far removed from when artists of the 19th century, like Hogarth, would engage an engraver to re-work his drawings into etchings. I also like to use digital processes for originating new work from scratch rather than just use it to reproduce existing work. 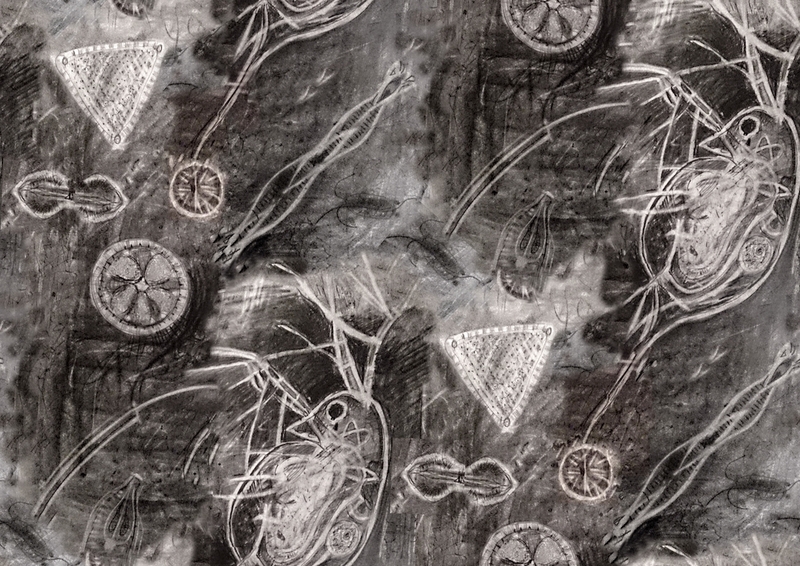 Waterflea Repeat detail, Step and repeat drawing for a printed linen banner installed at the Reading and Its Rivers Exhibition by Chris Mercier. Tegen: You focus intensely on process as a theme and different medias processes to expose and challenge their inner workings. Could you take us through your process of how you begin a piece to it reaching conclusion? Is there anything in particular that sparks an idea or makes you choose to begin in a certain medium? Chris: I have found that ideas pop up when you least expect them and from the most unlikely sources. It is often a “process” that becomes the inspiration or I fall upon an object that looks useful and sparks my imagination. When I don’t have a new idea I will return to observational drawing as I find this meditational and cathartic. Three Muses, Digital vector drawings showing three of the nine Muses series by Chris Mercier, 2017. Tegen: Reading over your artist statements and comments, you seem determined to push the boundaries of print and expose it’s limitations while creating something new. How do you see new and old technologies evolving and combining? What do you see coming out of this collaborative response? Chris: I am very cautious not to ghettoize printmaking into traditional and closed compartments. So yes, I think hybridity in printmaking is a good thing and can only lead to exciting new horizons. Polymnia – Digital vector drawing for Muses series by Chris Mercier. Tegen: Several of the prints you’re currently developing are Digital Vector Drawings, could you explain to us what a digital vector drawing is and which of its special traits appeal to you? Chris: In digital art making, vector drawing differs from pixel based programs like photoshop in that it is all about the “line” and a line has co-ordinates so drawings become infinitely scaleable without becoming pixelated. A line can be assigned a different thickness and colour and shaped with a variety of controls. A program like Adobe Illustrator is a good example. 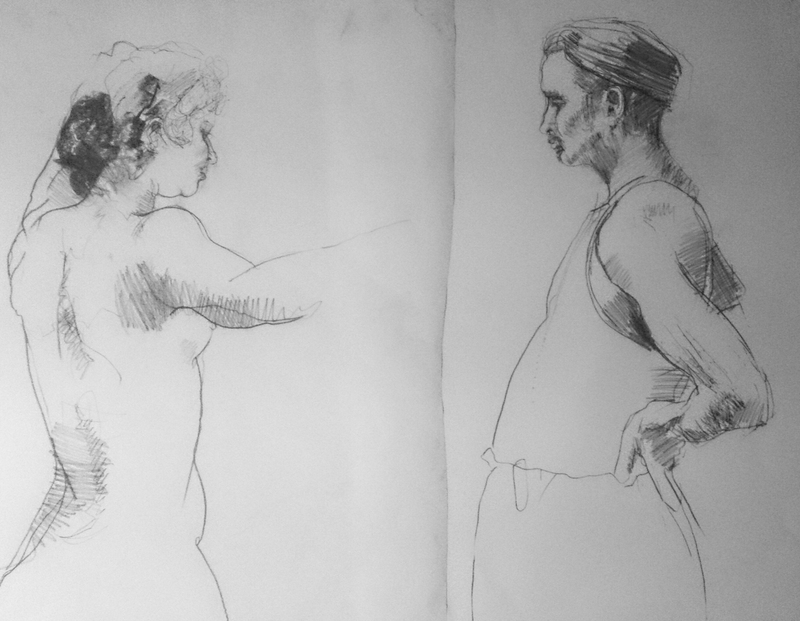 Recently I have enjoyed mimicking the gestural marks to be found in my own pencil drawings. Tegen: As you’ve started to combine digital and analogue printing, do you miss the textural and physical nature of producing physical prints? How do you feel working digitally affects your practice? Chris: I don’t see there is any qualitative difference between digital and analogue printmaking. I am happy moving from one to the other. The printing plate for the digital printmaker is a virtual matrix stored on a hard disc. Digital processes like physical processes have their own unique marks. I often equate digital art with musical composition. The digital file is the score and the print or projection is the performance. 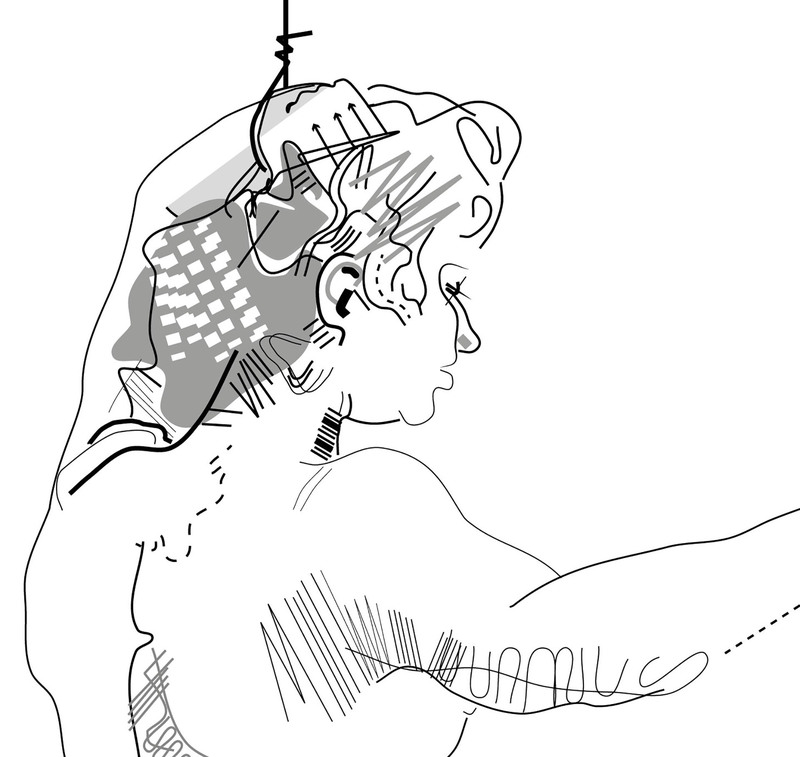 Victor Contemplates Eve, Detail of digital vector drawing used for the Frankenstein’s Toile by Chris Mercier. Tegen: Looking at your physical sketches for the Frankenstein patterns compared to your digital drawings, the subject and style seems to shift from fairly traditional to a more modern and pattern-based image, is this something you’ve noticed yourself? I also noticed much of your work uses a lot of bright almost pop colours, why did you choose a tonal palette for your work for the Frankenstein show? Chris: I think this is my enjoyment of “translation” that you have noted. It is a game that I play! I have used a very monochrome palette for the “Frankenstein’s Toile” because originally a printed “Toile” was an inexpensive printed fabric and they were frequently printed in only one colour on to cheap cotton. 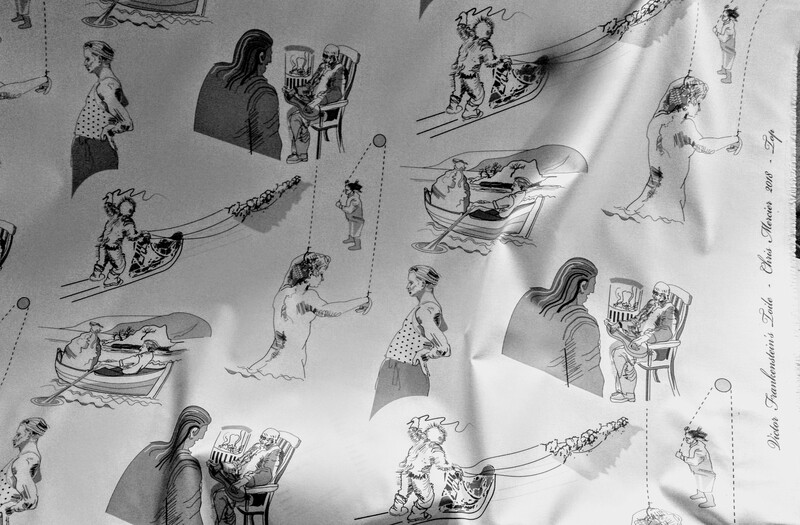 Toile Fabric, The Frankenstein’s Toile digitally printed on cotton fabric by Chris Mercier. Tegen: The Espacio show focuses on Mary Shelley’s novel Frankenstein as it’s coming up to the 200 year anniversary of it being published. It seems the perfect starting point for the themes you’re currently working on but is there a reason why you’ve actualised ‘Eve’ (the intended mate for Victor Frankenstein’s Monster) a character who never is made within the novel? What appealed to you about her? 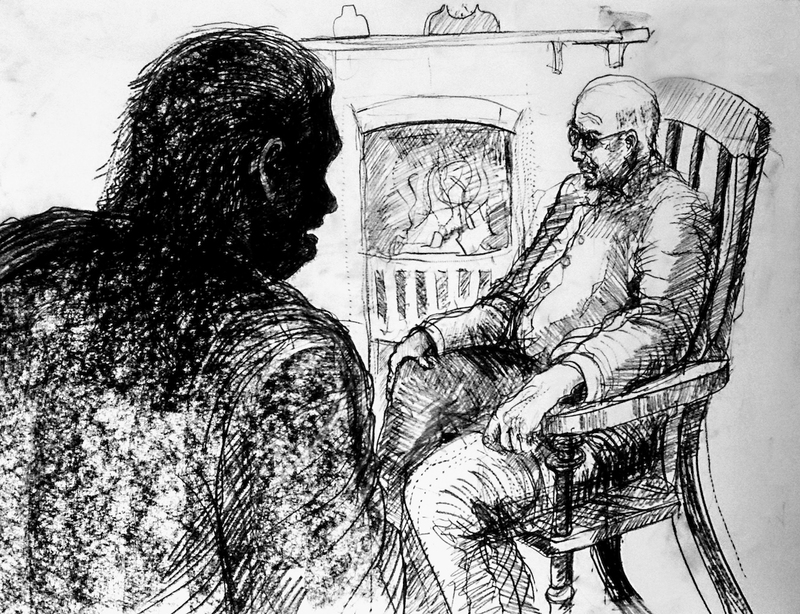 Chris: I have actualized “Eve” in my drawings because I can only think that Victor Frankenstein must have visualized not only the consequences of fulfilling the creature’s request for a partner but must have conjured up the image of her too. Step and Repeat, Final repeated digital drawing by Chris Mercier for Frankenstein’s Toile which will be installed at the Espacio Frankenstein Show 2018. Tegen: Your work with fabric and printing and storytelling is fascinating, particularly in the context of Frankenstein operating as a cyclical Chinese box narrative and your piece being a repeat print. Was this an intentional thematic link and could you explain why you work with fabric as well as any top tips on how to visualise or produce a repeat print? Chris: Yes, I suppose I see the repeat pattern as a metaphor and testimony to how the story of Frankenstein has become part of the fabric of our shared cultural history. Also, historically, a “Toile” fabric tells a well-known story (often biblical or classical) in a series of four or five images. I also work with textile designers so I think their craft has rubbed off on me and this also informs my art practice. 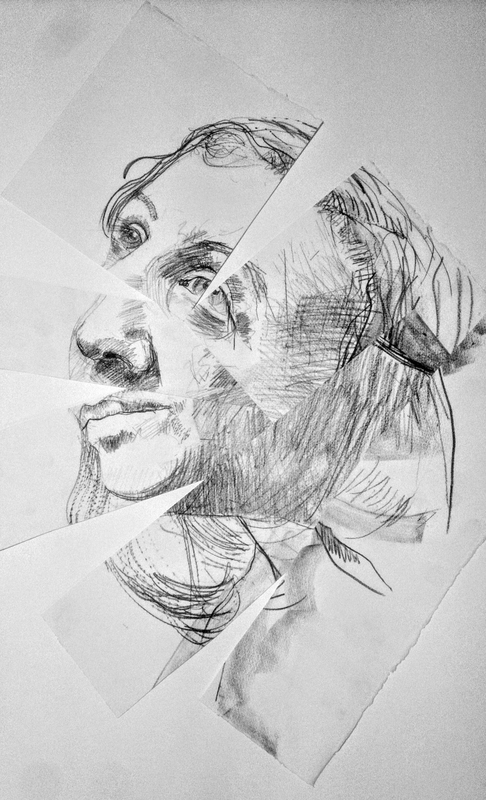 Shattered Face, Eve’s reflection – Conte drawing on paper, cut and manipulated for Frankenstein Show by Chris Mercier. Tegen: As an art suppliers, we have to ask do you have a favourite medium and what materials or products could you not do without? Chris: My favourite drawing implement is a Conte Pierre Noir pencil. I have them in 3 different weights. B, 2B and 3B. I also like good quality printmaking and watercolour papers. I usually buy them in large sheets with deckled edges. I find that if I buy a mill pack it works out cheaper. 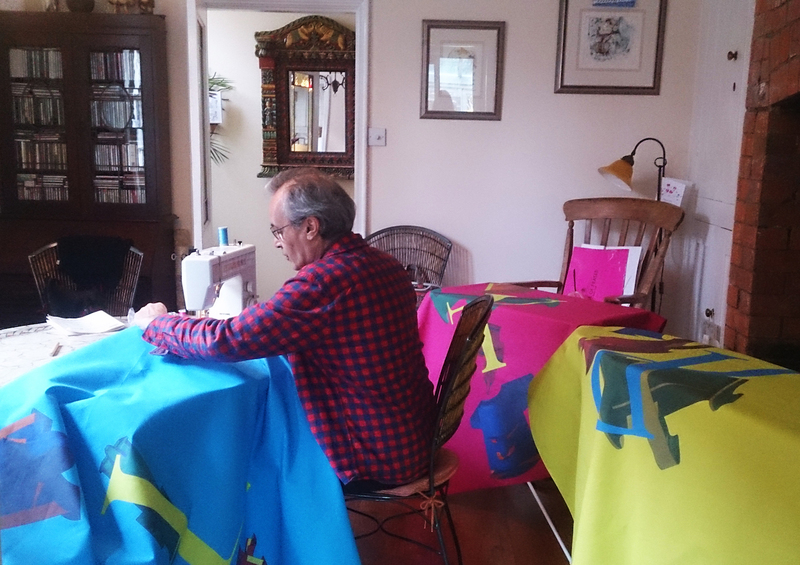 Chris Mercier finishing flags for Newfound Consonants installation at Lost and Found Show at the Espacio Gallery, 2017. Tegen: Where do you see your practice developing to and where online or in the flesh can we view more of your work? Chris: My next show is the group exhibition, previously mentioned, at The Espacio Gallery, London, this coming June, called Frankenstein. I am a member of The Printmakers Council with whom I exhibit at selected shows. I am also regularly involved with the Reading artists’ collective called OpenHand OpenSpace where I curate and exhibit my work. I participate annually in the RCA Secret show. My work can also be found on my website www.chrismercier.co.uk where my upcoming shows and events are listed. 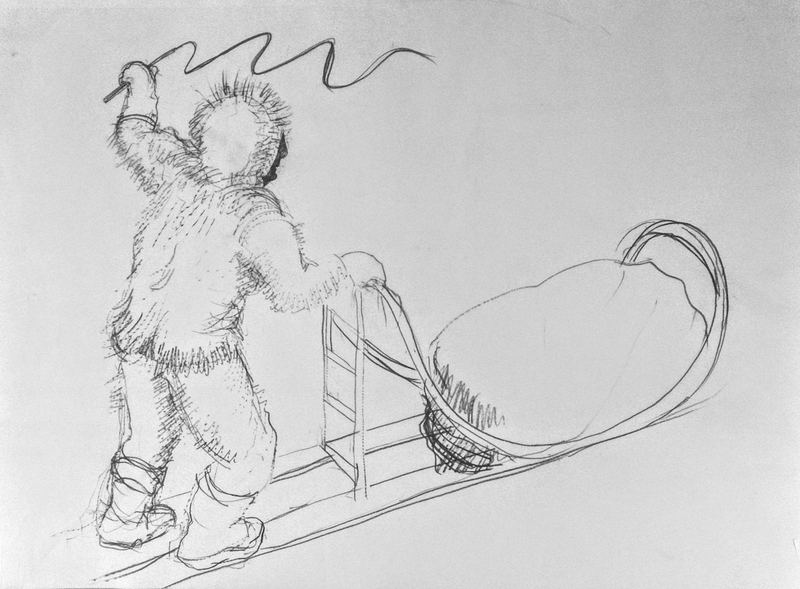 To The North Pole, Conte pencil drawing by Chris Mercier. This is a working drawing for the Toile, it depicts Frankenstein’s creature departing for the North Pole after murdering Victor’s bride. 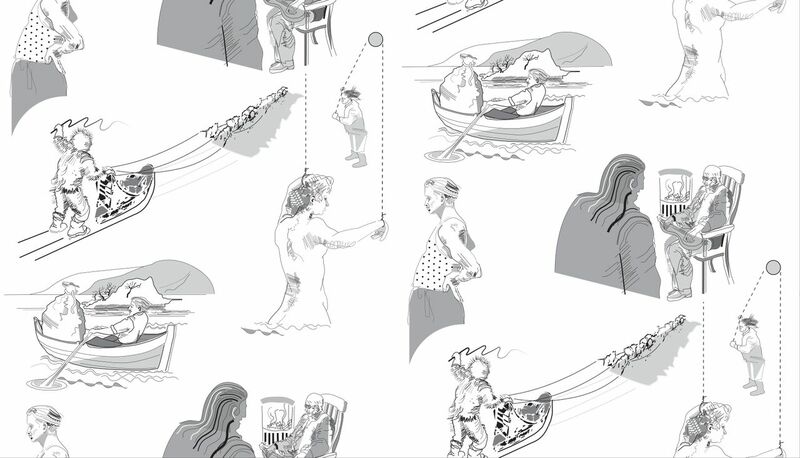 The image featured at the top is: Chris Mercier’s The Frankenstein’s Toile digitally printed on cotton fabric.